The 1920’s era Chandler Building, with its spiffy art-deco exterior is home to Moe’s staffers, one of whom wrote a mystery novel set in the building. Award-winning sci-fi writer, Jonathon Lethem, wrote at the Chandler while working at Moe’s. It wouldn’t be the first time Berkeley’s arts and literary types had been burned out. An apartment house fire 35 years ago, on Dwight, just West of the Chandler, scattered-to-the-winds a community of street-artists, musicians, and poets. As I saw faces I’d seen around for years standing on the street outside the Chandler apartments today, I felt an old sympathy for the displaced among us, past and present. Berkeley Inn burned down in 1984 and remains a vacant lot. The Inn was in, in a town of outs; crawling with poets, artists, musicians, mice, and roaches. 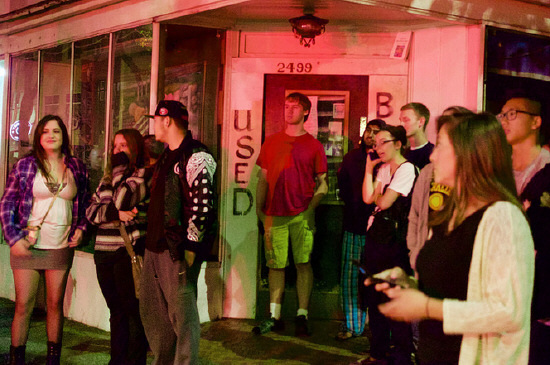 The Sequoia, which burned down four years ago on Telegraph was mostly students, but sometimes students sneaked in a street crazy or two to crash under the stairwells. A Hamster resident named Hammy entered Hamster Heaven there. For Sequoia students who were dislodged, new housing could be had, but fires at the Berkeley Inn and on Dwight scattered creatives and may have left Telegraph Avenue a squaresville, man. But this time, what could have been yet another setback for our neighborhood, is looking survivable. 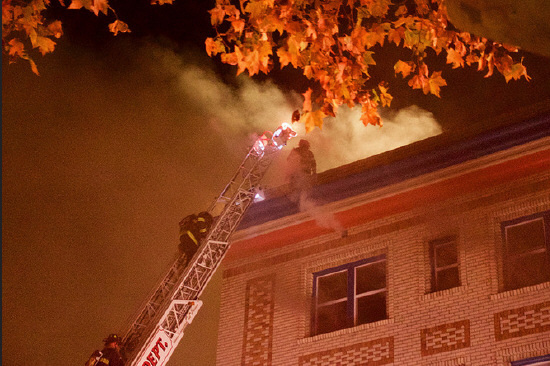 Three buildings in retail spaces beneath the Chandler were damaged, but they will survive. Chandler apartments evacuees will be able to return to their apartments in the foreseeable future. Moe’s Books was not damaged. It opened on time, the morning after the fire. I had just filed my photos from yesterday’s 3rd Annual Half-Marathon when I heard that there was a two-alarm fire only two blocks from me. Head of the pack and hard to catch. Photo by Ted Friedman. 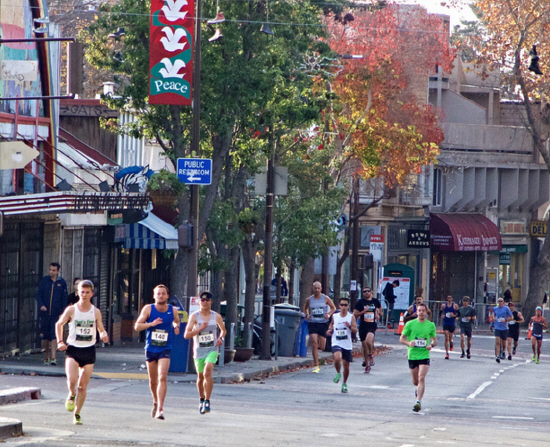 Earlier, I chased after the racers all over the South side, at U.C.Berkeley’s Campanile, and at the city hall finish. Now a photo story was a matter of a few blocks away from my apartment. A smoke-muted red glare filled Dwight Way, reaching nearby People’s Park. I couldn’t wait to start shooting and didn’t. 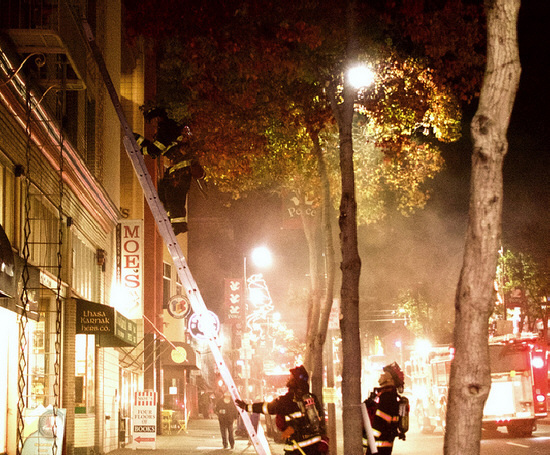 I shot Berkeley fire fighters up a ladder and behind a cloud of smoke. (lead photo) I shot the crowd, aglow with fire-engine red lights. I shot a firefighter climbing another ladder around the corner. There’s something vulgar about fire crowds; photographing the fire as a light and smoke show is vulgar, as well. This entry was posted on Wednesday, November 25th, 2015 at 7:48 am	and is filed under Telegraph Avenue, The Berkeley Scene. You can follow any responses to this entry through the RSS 2.0 feed. Responses are currently closed, but you can trackback from your own site.